One of the hottest markets in home furnishings is the the recycled plastic patio furniture niche. When you consider that the average household in the U.S. disposes of over 2 lbs of plastic on a daily basis you can appreciate the fact that there is no shortage of material for manufacturing these popular products. As a matter of fact, over 100,000 lbs of scrap plastic per day is kept out of landfills precisely for this purpose. The recycling process begins with breaking up the baled scrap and processing the material through an optical scanner which identifies and sorts the plastic by type. Most recycled plastic patio furniture is made with high density polyethylene (HDPE), the material used to make milk jugs. The remaining plastic is repackaged and made available for other manufacturing processes. To make recycled plastic patio furniture, the HDPE is first ground into flakes which are washed and dried, a process which also separates the plastic from any dirt or paper labeling that may remain. The HDPE flakes are now separated by optical machinery into different colors and loaded into silos. Auto-loading machines transfer the contents of the silo to an extruder where, as the plastic is melted into various shapes, while sophisticated computer modeling also refines the coloring operation and the inclusion of appropriate additives. Now regarded as ‘plastic lumber,’ the material is washed again to cool the extruded pieces and to evaluate the quality and consistency of the product. Cut to size, the material is stored by color and pre-drilled and fashioned by computer-guided machinery. With the addition of dyed nuts and bolts, these plastic lumber pieces can now be appropriately mixed and matched and made ready for assembly. 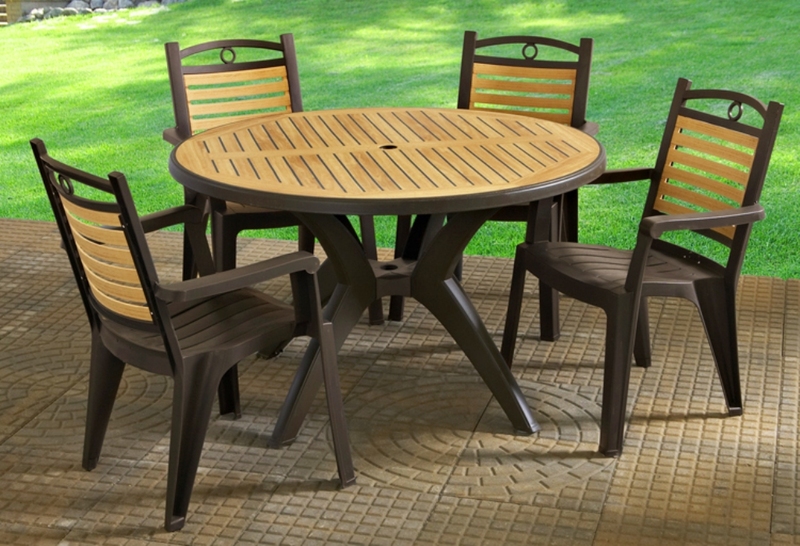 In a addition to its environmentally-friendly manufacturing process, recycled plastic patio furniture is much lighter than wood or iron and can better withstand erosion over time. It is also easier to clean and generally less expensive than other materials, even as the manufacturers can offer the consumer a larger variety of colors and designs. Breezesta, Polywood, Ketler, Amepac and Yardbird are some of the better-known recycled plastic patio furniture manufacturers in the United States.